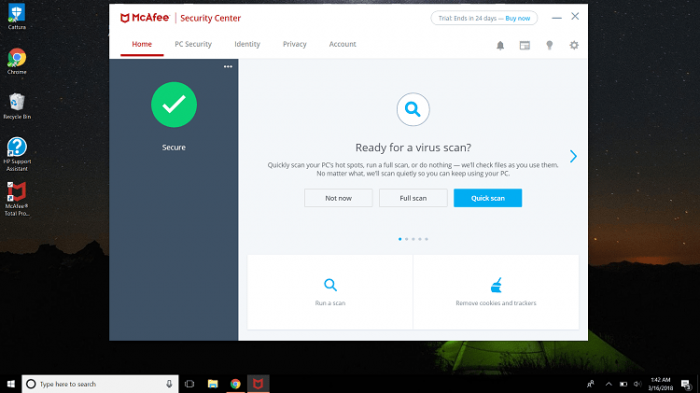 McAfee or ESET, which antivirus software is a better option in 2019? In this detailed guide, you’ll see what’s included in different antivirus suites both McAfee and ESET offer, as well as how both software compare against one another in terms of malware protection, system performance, user interface, cost, and more. Do you know you’re exposed to over 350,000 new malware threats every day? Malware attacks are happening at an alarming frequency these days, and it has become almost impossible to imagine a secure digital life without a reliable antivirus program. The bad guys (a.k.a. hackers) are constantly in search of new (and sneaky) ways to steal your data, breach your privacy, drain your bank account, corrupt your system, and so on. So if you don’t take proactive measures to protect your data and privacy, it’s likely that you’ll find yourself in a lot of trouble down the road. First, let’s see the security suites McAfee and ESET offer. If you are in a rush and want the answer right away, look at the graphic below and also read our short verdict. McAfee offers more security-enhancing features and extra utilities in its security suites than ESET. Independent tests prove that both software provide comprehensive protection against all sorts of malware threats, but McAfee is better than ESET in terms of system performance impact. Most antivirus companies offer a range of security suites at different price points to attract a diverse customer base. Back in the day, McAfee used to follow the same scheme but these days, it only offers two specialized antivirus suites, namely McAfee Total Protection and McAfee LiveSafe. McAfee Total Protection is the company’s top-drawer and most popular antivirus package. Along with providing excellent protection against all kinds of malware threats (as you’ll see later in this guide), it offers advanced ransomware protection, a useful two-way firewall (blocks malicious traffic and thwarts malware attacks), a Vulnerability Scanner (checks for exploitable vulnerabilities in your system), and a file shredding utility (helps securely remove your important files). A parental control module (helps protect your kids online and blocks inappropriate content), the Network Manager (safeguards your Wi-Fi network against intruders and hackers) and an encryption utility (lets you lock your sensitive files from ransomware-like threats). With McAfee Total Protection, you’ll also get five licenses of the True Key Identity Manager. It stores all your passwords and other sensitive details in a secure, digital vault. Protection against webcam spying, spam/phishing emails, and data theft is also there in the package. A single subscription of the package means you can protect up to 10 devices (PCs, Macs, and smartphones) in any combination with a single license of the suite. McAfee also offers the “Virus Protection Guarantee” if you sign up for its auto-renewal service. The pledge states that, in the event of malware infection, a McAfee expert will either remotely access your computer to remove it or give you a full refund. Another security suite that McAfee offers is McAfee LiveSafe. It comes at a higher price point and adds on 1GB of cloud space to the “Total Protection” suite. 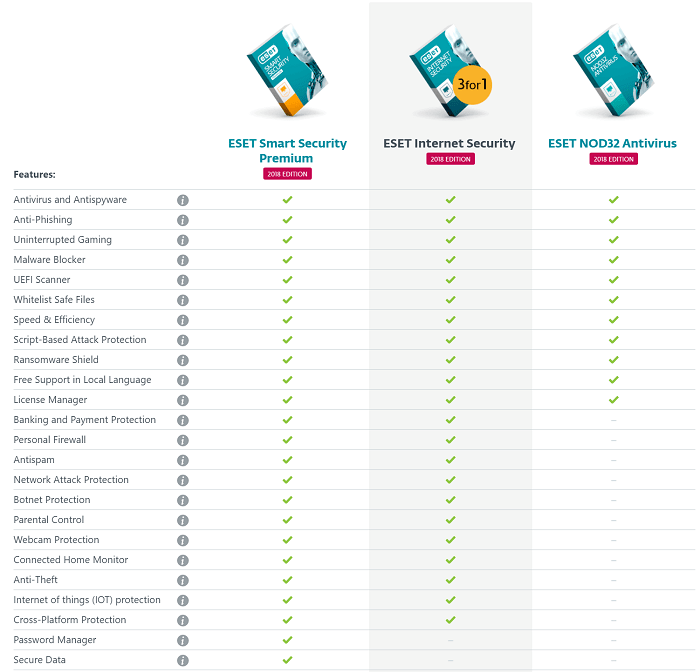 Unlike other companies, ESET offers separate products for different platforms. ESET NOD32 Antivirus is the company’s entry-level offering for the Windows users. Other than the useful Silent Mode feature (suspends notifications for uninterrupted experience), you won’t find a lot of advanced features or utilities jammed into this suite. But the product covers all the bases when it comes to protecting against different types of malware threats, including ransomware, viruses, worms, Trojans, and rootkits. Another level up is ESET Internet Security, which is another Windows-only product. It includes everything found in the entry-level offering, plus a hardened browser (protects your financial data while you shop/bank online), the Network Monitor utility (protects your network against hackers and intruders), a two-way firewall, and an anti-theft module (helps locate stolen or missing devices). Protection against webcam spying and junk/phishing emails is also integrated into the package. 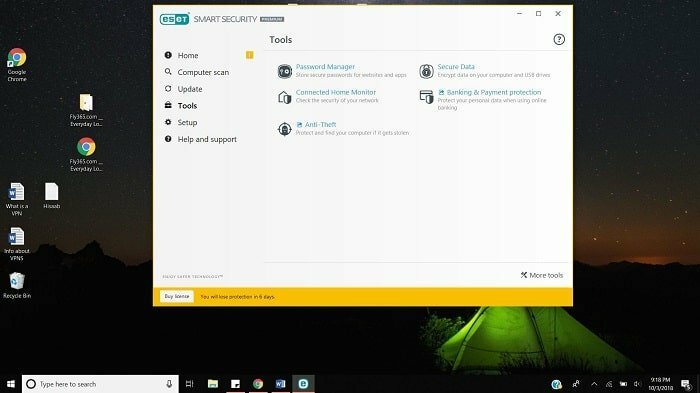 Next up is ESET Smart Security Premium — the company’s full-blown security suite for the Windows platform. In that, you’ll get everything that comes as part of the “Internet Security” plan, along with an advanced password management tool and the Secure Data utility (creates password-protected virtual drives to make your sensitive data inaccessible for hackers). ESET Multi-device Security is the company’s multi-platform compatible security package. A single license of this suite means you can use every ESET product in the self, including those specifically built for Mac and Linux. But, unlike Bitdefender, ESET imposes a limit on the number of devices you can protect with this suite. So, if you have many devices in your household, it would cost you much less if you go with Bitdefender Family Pack 2019. Now, let’s see what ESET offers for Mac platform. ESET offers two specialized security suites for macOS, namely ESET Cyber Security and ESET Cyber Security Pro. The former provides comprehensive protection against a range of malware threats, such as viruses, ransomware, worms, Trojans, along with web browsing protection and free customer support. The latter includes everything found in its younger sibling, plus a two-way firewall and parental controls. McAfee vs. ESET: Which Software Offers Better Malware Protection? It’s imperative for a security product to provide comprehensive protection against all kinds of malware threats. All malware can be classified into two types: known malware and unknown malware (also called zero-day malware). Usually, most security programs offer three levels of protection: a traditional file scanner that matches suspect files to known malware database, a heuristics scanner that takes behavioral attributes into account to detect zero-day malware, and a cloud server (that’s where suspicious files are sent for in-depth examination). To find out which of the two software is better in terms of malware protection, I will look at the most recent lab examinations conducted by AV-Test and AV-Comparatives – two popular and widely respected independent security laboratories. The experts at AV-Test regularly conduct different tests to evaluate how well a security product performs against different types of malware. The most recent tests were conducted in September and October 2018. All participating products were tested against 311 samples of zero-day malware and 21,257 samples of widespread malware. McAfee’s detection rate against widespread malware was flawless during both months, but it didn’t perform as well against zero-day malware, which means it received a slightly lower 5.5/6 rating from the AV-Test experts in the “Protection” category. ESET, on the other hand, didn’t participate in the recent AV-Test evaluations. 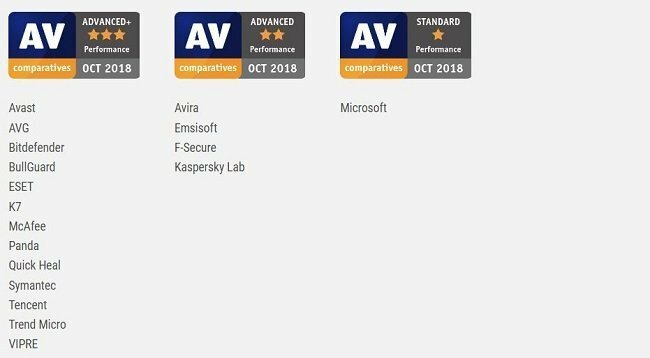 The experts at Austrian lab AV-Comparatives regularly perform a range of exhaustive tests to evaluate the performance of various antivirus brands. The two comprehensive tests that deserve a look are the Real-World Protection Test and Malware Protection Test. The latter test evaluates the effectiveness of a security product against malware injected via network drives and USB, while the former test comprehensively looks at how well a product defends against malware found on the web. The recent Real-World Protection Test report released by AV-Comparatives includes summarized results of five monthly tests which were held between July and November 2018. McAfee received the highest “ADVANCED+” award in this test, as it registered an impressive protection rate of 99.4% with 16 false positives. ***False positive is when a security product falsely flags a clean file/URL as malware. ESET could only get the second-best “ADVANCED” title in the “real-world” study, mainly because of its slightly lower protection rate of 98.9%. It also returned 4 false positives during the tests. In the latest version of the Malware Protection Test, which was held in September 2018, ESET managed to get the highest “ADVANCED+” award, due to its near-perfect 99.94% protection rate with just one false detection. McAfee’s protection rate was even better, at 100%, but a high number of false detections (35) overshadowed its results. It had to settle for the second-best “ADVANCED” title in this test. Overall, both McAfee and ESET are neck and neck when it comes to malware protection. McAfee vs. ESET: Which Software Puts Less Impact on System? Antivirus software – like other computer programs – need (or consume) some percentage of your system resources to do their job. Luckily, most modern computer security programs don’t put a significant burden on system performance. 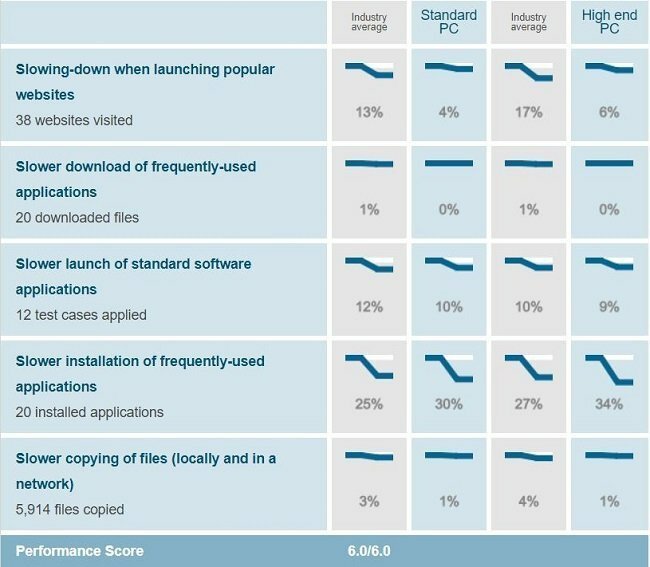 Let’s look at the recent performance tests to see how McAfee and ESET compare in this regard. In the “Performance” section of the AV-Test evaluations, the experts measure the impact a security product puts on system performance (or system speed) while executing common computer operations. The impact (or influence) of a security product is measured in terms of system slowdown experienced on test computers. McAfee got a full 6/6 rating from the experts in the “Performance” category. ESET, as mentioned earlier, didn’t participate in the recent AV-Test evaluations. The experts at AV-Comparatives lab conduct a similar examination, called Performance Test. The most recent edition of the test involved 17 antivirus products and was held in September 2018. Both McAfee and ESET were awarded the highest “ADVANCED+” award in the test, courtesy impressive impact scores of 6.4 and 1.7, respectively. Overall, McAfee comes out as the winner in this category as it got exceptional scores in all the tests we considered. McAfee vs. ESET: Which Product Offers Better User Experience? Back in the day, McAfee’s user interface used to be complicated and overwhelming but it’s no longer the case – thanks to a major product update that took place in 2018. It’s now bright and straightforward, in shades of white, blue, and dark gray. At the top is a horizontal menu which contains five modules, namely Home, PC Security, Identity, Privacy, and Account, along with icons for Settings, Help, Alerts, and Tips. Home is where you land on when you open the interface. If everything is safe and sound, you’ll see a green checkmark in the left rail. In the main view, you’ll find buttons for running different types of scans and square-shaped titles for setting up different advanced modules, like the True Key identity manager. PC Security, Identity, and Privacy tabs contain relevant features/tools. Account window has information regarding your subscription plan. Now, let’s delve into the ESET interface. ESET’s interface is simple, bright and functional, in colors of black, dark green, and light gray. Along the left side is a horizontal menu with the following categories: Home, Computer Scan, Update, Tools, Setup, and Help & Support. When you start up the software, you’ll land on the default Home window which shows your protection status next to a creepy robot (okay, it’s not so scary). When everything is okay, you’ll be greeted with a reassuring “You’re Protected” message with a green checkmark. Links to access different advanced modules are also available on the main window. The name of the suite you’re subscribed to is shown in the title bar. At the bottom, you’ll see the number of days remaining in your subscription. Overall, both McAfee and ESET offer a simple, easy-to-use user interface. McAfee vs. ESET: Which Software is Less Expensive? Overall, McAfee’s security suites are cheaper than ESET’s. Also, you can protect multiple devices with a single license of McAfee. McAfee vs. ESET: Which Software is More Popular Among Users? Now, let’s see which of the two software is more popular among the antivirus community. According to the report, Avast is currently the biggest player in the market with an impressive 18.44% market share, followed by McAfee (12.58%) and Malwarebytes (12.23%). ESET is fifth on the list with 9.09% share. Overall, McAfee’s security suites are cheaper than ESET’s. Also, you can protect multiple devices with a single license of McAfee. Overall, it is evident that McAfee currently captures more market share than ESET.